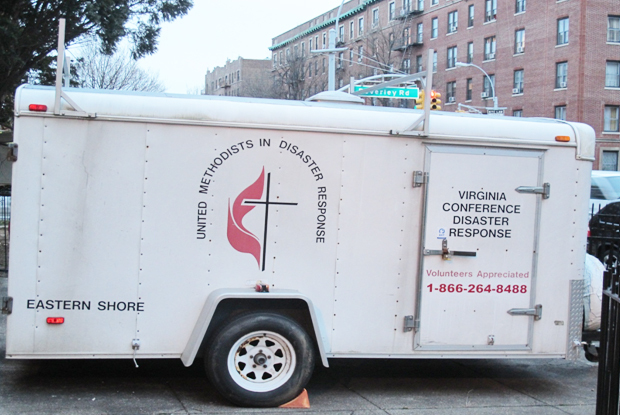 The Brooklyn Disaster Response Office recently received a boost for its work from the Virginia Annual Conference when we were loaned one of their tool trailers. Not only were we the recipients of the loan, but they were kind enough, through the efforts of “Disaster Pastor” Frank Jenning, to deliver it to us. Pastor Frank drove the RV that towed the trailer to our site office in Brooklyn in the early hours of the morning. The trailer has been very useful to teams of volunteers coming to the area. We had one team who flew in from Illinois and having the trailer made a big difference, likewise another which came in from Maryland. We would like to thank the Disaster Response Ministry from the Virginia Annual Conference for their show of support and collaboration in this aspect of our work.